Le Raccourci is a welcome introduction to the world of Sebastian Gandera. The impressionist landscapes of a sensitive soul self-reflecting, these miniature compositions alternate across a rudimentary set up of piano, field recorder, sampler and four-track recorder, melancholic utterings hastily captured some 100km east of Paris. Classically trained by the same teacher as his parents, Gandera first began recording in the confines of his university dorm room, inspired by a C60 from friend and future collaborator Bernard Odot (A Gethsémani). Humbly existing without sparing a thought to music industry or career, Gandera’s personal efforts surfaced via the European and US cassette networks from 1988 to 1994. Impressively accomplished for the DIY scene they orbited, these tapes were issued in scant quantities, rendering his pieces as private secrets shared and duplicated in small concentric circles. Aside from a sole, avowedly traumatic performance, the material was never shared in a live context. 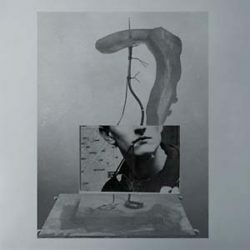 Selected by Sky Girl co-conspirer Julien Dechery, Le Raccourci culls 15 tracks from Gandera’s extensive cassette discography, discarded DAT recordings, and split CD with Lyon toy music project Klimperei. These sentiently charged compositions only hint at his larger catalog, but act as a compelling cross-section of the artist’s oeuvre. The identity is further detailed by archival images, Glen Goetze-penned liner notes and original artwork from Perks and Mini’s Misha Hollenbach. While Gandera’s nostalgic melodies incidentally parallel with the piano key manoeuvres of Pascal Comelade, Robert Haigh and Dominique Lawalrée, Le Raccourci could only stem from the escapist desires of Eric Morin.